Though their large size can be intimidating, the Neapolitan mastiff dog breed is a gentle giant that makes an excellent family pet. These dogs love their families unconditionally but are wary of strangers. There is no doubt these dogs will protect you from an intruder. Their fearless and protective attitude is sure to frighten any unwanted visitors. In general, Neapolitan mastiffs are quite low-maintenance, easy-going pets. Like all pets, they have their quirks. Here is everything you need to know about this adorably huge dog breed. Coat and Color: Neapolitan mastiffs can appear black, blue, mahogany, and tawny in color. They may also have a brindle pattern on their short coat. Tales and images of the Neapolitan mastiff date back as early as 700 B.C. In fact, you can thank Alexander the Great for their great reverence and good looks. In the 4th century B.C., he crossed his famous giant war dogs with short-haired Indian dogs to create a breed known as the molossus, which he used in battle. The Romans took note and later adopted the molossus breed for their own use in combat and hunting and eventually crossed them with other large breeds to create an even bigger and intimidating canine: the mastino. The mastino was selectively bred by farmers in southern Italy to develop a breed large in size with loose, saggy skin and a smooth coat. In their selective breeding, they also aimed to develop a dog that was more family-friendly than the mastino, while still being a top-notch guard dog and protector. 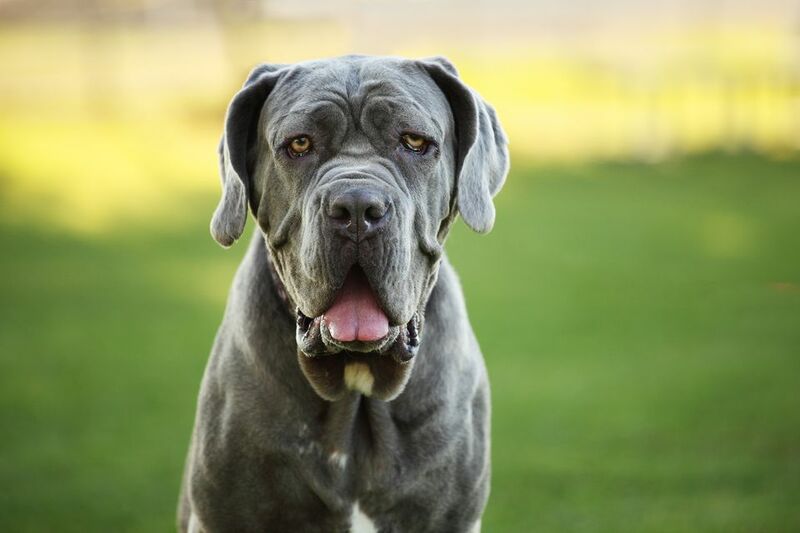 This breed became known as the Neapolitan mastiff, named after its origin city of Naples. The dog soon became a national treasure in Italy and six of them were reportedly shown in the first dog show in Naples in 1946. Italian painter Piero Scanziani drafted the breed standard in 1948 and the Italian Kennel Club officially recognized the breed the following year. The breed spread throughout Europe in the 1970s and soon made its way to America. The United States Neapolitan Mastiff Club became the primary register for the breed in the 1990s and the American Kennel Club officially accepted the Neapolitan mastiff into the Working Group in 2004. While Neapolitan mastiffs can be couch potatoes, you should still walk yours at least twice daily. They do not require a lot of exercise, but regular walks are crucial for managing weight and joint health. As puppies, this big breed is a different story. Neapolitan mastiff puppies are generally energetic and playful, but it is up to you to know when enough is enough. Because their bones are so big, joints can be easily damaged. To prevent this, limit your puppy’s running and jumping activity and make sure they do not climb up stairs too quickly. Keep an eye on them, especially in warm weather as they are prone to overheating, and stop play before your pup gets too tired. Training your Neapolitan mastiff should begin as soon as possible, preferably during puppyhood. As they get older, individuals can become stubborn and difficult to train, so it is important to get on top of things at an early age. Because they are wary of strangers and naturally suspicious of outsiders, socialization training is key. Take your Neapolitan mastiff to public spaces like the park or a neighborhood cafe on a regular basis, so he or she can learn how to welcome guests appropriately and distinguish between friend and foe. Neapolitan mastiffs are not responsive to negative reinforcement or punishment. Instead, they respond well to lots of love and treats to reward any good behavior during training. The same is true during grooming—treat them with love when they resist bath time. Enormous, muscular, and wrinkly, the Neapolitan mastiff seems like a challenge to keep clean. Weekly brushing will make things easier by keeping their coat clean and managing shedding. With regular brushing, you can keep baths on an as-needed basis. Just make sure to wipe their wrinkles down—and dry them completely—on a daily basis to remove any dirt or other unwanted debris. Regular nail trimming, ear cleaning, and teeth brushing will also enhance your Neapolitan mastiff’s overall health and wellbeing. And do not forget to keep a slobber rag handy. Joint health is a concern for Neapolitan mastiffs due to their large size. With all of their extra skin and big muscles, their joints are carrying a lot of weight. For this reason, Neapolitan mastiffs are predisposed to issues like elbow and hip dysplasia, as well as arthritis. When assessing your dog’s health, make sure to ask your vet for a hip and elbow evaluation. You can ask for these tests before adopting, too, to ensure your new pup’s good health. The condition known as bloat is another issue to be aware of, as it can result in sudden death. Bloat affects all deep-chested dogs and happens when they eat or drink too quickly. When this happens, their stomach can twist and fill with gas, which can sometimes rupture their stomach or cause damage to other organs. Bloat can be prevented by keeping feeding portions small and frequent or using a “slow feed” food bowl. It’s also helpful to try to reduce your dog’s stress around feeding time. The nutrition requirements of a Neapolitan mastiff are not very different than those of other pets. They should be fed a high-quality diet and provided fresh water at all times. To find a quality dog food, check the first ingredient. The healthiest foods list a protein source, like chicken or beef, first. Avoid foods with lots of fillers like animal by-products and pulp that lack essential nutrients. Natural, whole ingredients are best for your dog’s digestive system. According to the American Kennel Club, experienced Neapolitan mastiff breeders recommend food that is slightly higher in fat and lower in protein, especially for younger dogs who grow rapidly. Discuss any diet and nutrition concerns with your veterinarian. If you have not found what you are looking for, take a look at all of our other dog breed profiles.